Prince Harry, the Duke of Sussex, and Meghan Markle, the Duchess of Sussex, leave St George’s Chapel after their wedding in St. George’s Chapel at Windsor Castle on May 19, 2018, in Windsor, England. It was a day seemingly made for happily ever after. On Saturday, Meghan Markle’s fairy tale came true when, at last, she married her Prince Charming Harry. The traditionally drizzly English skies gave way to dazzling sunshine, and as many anticipated, the ceremony was as refreshingly unexpected as the pairing of the biracial American actress and the sixth in line to the British throne, with the bride’s black heritage strongly represented throughout. But one thing we did expect were some major style moments, both from the bride and from the star- and nobility-studded crowd who attended. And for the most part (that Gucci was a miss, Sabrina Dhowre), we were not disappointed. Of course, beyond the “Will he or won’t he?” drama concerning the attendance of the bride’s father, the bigger mystery was who would design Markle’s wedding gown. 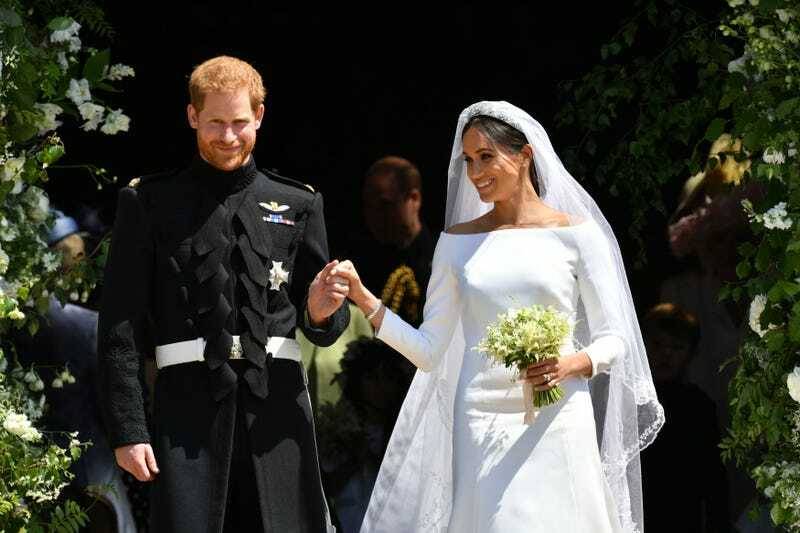 While it was expected that she would choose a British designer for her big day, the bride’s ultimate choice came with a French twist: Her dress was designed by Englishwoman Clare Waight Keller for legendary French fashion house Givenchy. Working closely with Markle, Waight Keller produced a sleek, elegant and timeless A-lined silhouette with three-quarter sleeves and an impressive train, made of a gleaming double-bonded white silk cady developed especially for the bride, and bolstered by an underskirt of triple silk organza. Impressively constructed using only six meticulously placed seams, the minimalist design and open bateau neckline kept the focus on the bride’s beaming face. Peeking out from under her gown were white silk duchesse-satin shoes based on a Givenchy “refined pointed couture” design. Although Markle’s wedding attire was produced by a French fashion house, her choice of acclaimed British designer Waight Keller was a very strategic one that reflected Markle’s commitment to gender equality: Last year, Waight Keller became the first female artistic director in Givenchy’s 66-year history. Prince Harry, Duke of Sussex, and Meghan, Duchess of Sussex, leave St. George’s Chapel at Windsor Castle after their wedding ceremony on May 19, 2018, in Windsor, England. Markle’s cathedral-length veil, also designed by Waight Keller, was both a tribute to the British Empire and, concurrently, a likely unintentional nod to its imperialist history. To represent all 53 countries of the Commonwealth, the perimeter of Markle’s 5-meter-long (approximately 16 feet) silk tulle veil was hand-embroidered in silk threads and organza with a trim featuring flowers from each country, including nations in Africa, the Caribbean, Asia and the Pacific, in addition to the United Kingdom. The bride also added two personal flowers to the motif: wintersweet—which grows in front of Nottingham Cottage, the home she shares with her new husband on the grounds of Kensington Palace—and her own state flower, the California poppy. Meghan Markle and her bridal party arrive at St. George’s Chapel at Windsor Castle for her wedding to Prince Harry on May 19, 2018, in Windsor, England. As is tradition, the bride’s tiara was loaned to her by her new grandmother-in-law, Queen Elizabeth II. However, while many speculated that Markle would wear a tiara worn by Harry’s late mother, Princess Diana, Markle’s wedding-day tiara was originally made for Queen Mary, Princess of Teck. The flexible, bandeau-style platinum-and-diamond headpiece was made in England in 1932, with the centerpiece—which conveniently functions as a brooch when detached—dating back to 1893. Markle’s coordinating earrings and bracelet were made by Cartier. The Duchess of Sussex departs after her wedding to Prince Harry, Duke of Sussex, at St. George’s Chapel at Windsor Castle on May 19, 2018, in Windsor, England. Markle’s bespoke bridal bouquet, designed by florist Philippa Craddock, was surprisingly simple and relaxed, consisting of spring flowers. Following royal tradition, it also featured sprigs of myrtle, as well as Princess Diana’s favorite flower, forget-me-nots. As an especially sweet added touch, Prince Harry handpicked several flowers yesterday from the couple’s private garden at Nottingham Cottage to add to the bouquet, which was then bound with a naturally dyed raw-silk ribbon. Markle’s fresh-faced but starry-eyed bridal beauty was due to the talents of longtime friend, makeup artist and Dior ambassador Daniel Martin. Her slightly smoked eye and pumped-up lashes perfectly offset her soft pink lip, visible freckles, gleaming cheek and collarbones. Famed hairstylist Serge Normant reinterpreted Markle’s trademark messy bun by pinning coils of hair into a romantic low chignon. Hilariously, the style sent several members of the at-home viewing audience into a tizzy, as it appeared to become more tousled as the ceremony progressed. Personally, we thought the look represented exactly the type of fresh, relaxed, authentic energy the newest royal couple seems to exude, as well as a new era for the British monarchy. But the only person whose opinion really mattered gave his approval without hesitation. On hand to witness the nuptials were, of course, the British royal family, several celebs—including Oprah, Idris Elba, George and Amal Clooney, Markle’s friends Serena Williams and Priyanka Chopra, as well as her castmates from her now former hit show, Suits. And then there was the bride’s gorgeous mother, Doria Ragland, who more than held it down as the sole member of Markle’s family in attendance. For the ceremony, she donned an elegant custom celadon dress and day coat designed by Oscar de la Renta creative directors Fernando Garcia and Laura Kim, embroidered in a floral motif evocative of her daughter’s veil. Doria Ragland leaves St. George’s Chapel at Windsor Castle after the wedding of Prince Harry, Duke of Sussex, and Meghan Markle, Duchess of Sussex, on May 19, 2018, in Windsor, England. Ragland paired the outfit with beige heels by Aquazurra and wore a custom-designed hat atop her locs made by British milliner Stephen Jones, OBE. Jones has created many of the noteworthy hats Markle has worn since moving to the U.K.; she also commissioned him to create custom hats for several of her closest friends to wear to her wedding. Speaking of hats, they were part of the requested attire for women attending the royal wedding. Much like in the black church (which Markle brought to her new homeland via her wedding ceremony), hats are a major part of British church tradition, and always an attraction unto themselves (remember the hats Prince William’s cousins wore to his 2011 nuptials?). Actresses Janina Gavankar, Abigail Spenser and Priyanka Chopra arrive at St. George’s Chapel to attend the wedding of Prince Harry and Meghan Markle on May 19, 2018. But when done right, a fantastic hat or well-matched fascinator (as the British have a predilection for) can take an already great outfit over the top; just ask Serena Williams, Amal Clooney and Priyanka Chopra, a few of this royal wedding’s style stars. Idris Elba and Sabrina Dhowre followed by Oprah Winfrey (fourth right) arrive at St George’s Chapel at Windsor Castle for the wedding of Meghan Markle and Prince Harry on May 19, 2018, in Windsor, England. Oprah Winfrey (in Stella McCartney) arrives at St George’s Chapel at Windsor Castle before the wedding of Prince Harry to Meghan Markle on May 19, 2018, in Windsor, England. Idris Elba (in Givenchy) and Sabrina Dhowre (in Gucci) arrive at St. George’s Chapel at Windsor Castle before the wedding of Prince Harry to Meghan Markle on May 19, 2018, in Windsor, England. Amal (in Stella McCartney) and George Clooney arrive at St. George’s Chapel at Windsor Castle before the wedding of Prince Harry to Meghan Markle on May 19, 2018, in Windsor, England. Amal Clooney (in a Stephen Jones hat) and George Clooney arrive at St. George’s Chapel at Windsor Castle before the wedding of Prince Harry to Meghan Markle on May 19, 2018, in Windsor, England. Serena Williams (in Versace) and her husband, Alexis Ohanian, arrive for the wedding ceremony of Britain’s Prince Harry and Meghan Markle at St. George’s Chapel, Windsor Castle, on May 19, 2018, in Windsor, England. Serena Williams wears a Stephen Jones-designed fascinator at St. George’s Chapel at Windsor Castle before the wedding of Prince Harry to Meghan Markle on May 19, 2018, in Windsor, England. Joss Stone arrives at St. George’s Chapel at Windsor Castle for the wedding of Prince Harry to Meghan Markle on May 19, 2018, in Windsor, England. Actress Carey Mulligan (in Erdem) and her husband, musician Marcus Mumford, arrive at St. George’s Chapel at Windsor Castle before the wedding of Prince Harry to Meghan Markle on May 19, 2018, in Windsor, England. Suits actor Patrick J. Adams and wife Troian Bellisario arrive at St. George’s Chapel at Windsor Castle before the wedding of Prince Harry to Meghan Markle on May 19, 2018, in Windsor, England. Suits actor Gabriel Macht and wife Jacinda Barrett arrive at St. George’s Chapel at Windsor Castle before the wedding of Prince Harry to Meghan Markle on May 19, 2018, in Windsor, England. Suits actress Gina Torres arrives at St. George’s Chapel at Windsor Castle before the wedding of Prince Harry to Meghan Markle on May 19, 2018, in Windsor, England. Gina Torres (in Costarellos) arrives at St George’s Chapel at Windsor Castle before the wedding of Prince Harry to Meghan Markle on May 19, 2018, in Windsor, England. James Corden and Julia Carey (left) arrive for the wedding ceremony of Prince Harry and Meghan Markle at St. George’s Chapel, Windsor Castle, on May 19, 2018, in Windsor, England. Uncle of the groom Charles Spencer and Karen Spencer arrive at the wedding of Prince Harry to Meghan Markle at St. George’s Chapel, Windsor Castle, on May 19, 2018, in Windsor, England. Lady Kitty Spencer arrives at St. George’s Chapel at Windsor Castle before the wedding of Prince Harry to Meghan Markle on May 19, 2018, in Windsor, England. Lady Kitty Spencer (in Dolce & Gabbana) arrives at the wedding of Prince Harry to Meghan Markle at St. George’s Chapel, Windsor Castle, on May 19, 2018, in Windsor, England. Victoria Beckham (in Victoria Beckham) and David Beckham arrive for the wedding ceremony of Prince Harry and Meghan Markle at St. George’s Chapel, Windsor Castle, on May 19, 2018, in Windsor, England. Pippa Middleton (in the Fold) and James Matthews arrive for the wedding ceremony of Prince Harry and actress Meghan Markle at St. George’s Chapel, Windsor Castle, on May 19, 2018, in Windsor, England. Will Greenwood and Caroline Greenwood arrive for the wedding ceremony of Prince Harry and Meghan Markle at St. George’s Chapel, Windsor Castle, on May 19, 2018, in Windsor, England. Sarah, Duchess of York, arrives at St. George’s Chapel at Windsor Castle before the wedding of Prince Harry to Meghan Markle on May 19, 2018, in Windsor, England. Actresses Abigail Spencer (in Alessandra Rich) and Priyanka Chopra (in Vivienne Westwood) arrive at the wedding of Prince Harry to Meghan Markle at St. George’s Chapel, Windsor Castle, on May 19, 2018, in Windsor, England. Suits actress Sarah Rafferty (in Lanvin) arrives at St. George’s Chapel at Windsor Castle before the wedding of Prince Harry to Meghan Markle on May 19, 2018, in Windsor, England. Suits actor Rick Hoffman arrives at St. George’s Chapel at Windsor Castle before the wedding of Prince Harry to Meghan Markle on May 19, 2018, in Windsor, England. Princess Eugenie; Prince Andrew, Duke of York; and Princess Beatrice arrive at St. George’s Chapel at Windsor Castle before the wedding of Prince Harry to Meghan Markle on May 19, 2018, in Windsor, England. Catherine, Duchess of Cambridge (in Alexander McQueen), and Princess Charlotte leave St. George’s Chapel, Windsor Castle, after the wedding of Prince Harry and Meghan Markle on May 19, 2018, in Windsor, England. Prince George of Cambridge; Jasper Dyer; Princess Charlotte of Cambridge; Catherine, Duchess of Cambridge; Jessica Mulroney; Ivy Mulroney; Florence van Cutsem; Zoe Warren; Zalie Warren; Benita Litt, Remy Litt; and Rylan Litt arrive at St. George’s Chapel at Windsor Castle for the wedding of Prince Harry and Meghan Markle on May 19, 2018, in Windsor, England. Prince Charles, Prince of Wales, and Camilla, Duchess of Cornwall, arrive at St. George’s Chapel at Windsor Castle before the wedding of Prince Harry to Meghan Markle on May 19, 2018, in Windsor, England. Prince Harry walks with his best man, Prince William, the Duke of Cambridge, as they arrive at St. George’s Chapel at Windsor Castle before the wedding of Prince Harry to Meghan Markle on May 19, 2018, in Windsor, England. Meghan Markle (right) with her mother, Doria Ragland, drive down the Long Walk as they arrive at Windsor Castle ahead of her wedding to Prince Harry on May 19, 2018, in Windsor, England. Mother of the bride Doria Ragland arrives at St. George’s Chapel at Windsor Castle before the wedding of Prince Harry to Meghan Markle on May 19, 2018, in Windsor, England. Queen Elizabeth II arrives at St. George’s Chapel at Windsor Castle before the wedding of Prince Harry to Meghan Markle on May 19, 2018, in Windsor, England. While we understand that not everyone caught the royal-wedding fever we did in the wee hours of Saturday, we feel safe in saying this history-making event was well worth losing sleep over, and may just be the best royal wedding ever. After all, it’s not every day the world’s most famous family is forced to make progress.